Anecdotal evidence of an overdose increase in the last two weeks raises suspicion that heroin is being mixed with drugs like fentanyl or carfentanil. Members of the drug treatment community in Greater Portland have noticed a possible spike in overdose deaths in the last two weeks and are wondering whether heroin on the street contains more powerful opioids such as fentanyl or carfentanil, an elephant tranquilizer. Official drug overdose death statistics from the Maine Attorney General’s Office for 2017 haven’t yet been released, but partial-year data is expected within the next two weeks. Maine had 376 overdose deaths in 2016, an all-time high, fueled by the heroin crisis. 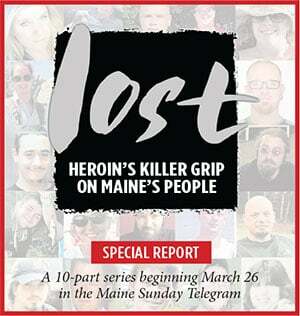 This spring, the Portland Press Herald published “Lost,” a 10-day series on the crisis examining the many causes and highlighting the personal stories of more than 60 Maine families affected by drug overdose deaths. Anecdotally, there’s been a lot of talk about overdose deaths in Greater Portland in recent weeks, said Zoe Odlin-Platz, a community health promotion specialist with Portland Needle Exchange, which gives users needles, testing and prevention education. “It feels significant. Like there’s a lot more overdoses. Word on the street is that it’s fentanyl or carfentanil, but we don’t have any data saying that,” Odlin-Platz said. When heroin is combined with other more powerful opioids such as fentanyl or carfentanil users often don’t realize it, and deaths can increase because a dose of what they believe is heroin is much more potent when it contains the other drugs. The Attorney General’s Office confirmed that one overdose death in April in York County was caused by carfentanil, which is 5,000 times as potent as heroin and 100 times as powerful as fentanyl. Odlin-Platz said she’s also heard that heroin is being combined with benzodiazapenes, which are used to treat anxiety and depression but can be abused. In June, the New Hampshire Attorney General’s Office said it was investigating three dozen criminal cases involving carfentanil. There have been six confirmed carfentanil deaths in New Hampshire, The Associated Press reported. Dr. Mary Dowd, an addiction specialist who works at the Milestone Foundation’s detox center in Portland, said there’s been some talk about carfentanil among people who come to the center, but it’s impossible to know the extent of the problem. The Press Herald has published seven obituaries since July 22 that said the cause of death was a drug overdose, and six of those were in Greater Portland. It’s difficult to determine whether a spike is occurring because many families print obituaries without saying that the cause of death was an accidental overdose. So it could simply be that more people than usual are disclosing overdoses as the cause of death in obituaries. It’s not just newspaper obituaries, though, as those in treatment and recovery community say that they’ve been hearing more people talk about overdose deaths, especially in the last week. “Within the last two weeks, there’s been a lot of overdose deaths that I’ve been personally aware of,” said Steve Cotreau, program manager at the Portland Recovery Community Center, a support and social group for those recovering from their addictions. Cotreau said he has no way of knowing whether the deaths he’s hearing about mean there’s been a jump in overdose deaths in Greater Portland this summer. Scott Pelletier, Maine Drug Enforcement Agency commander, said when they seize heroin during drug busts, it’s often impossible for them to immediately know if other drugs are present. Pelletier said fentanyl and carfentanil are so powerful that dealers can mix the equivalent of only “three grains of salt” into the heroin. The preliminary tests conducted by the MDEA are unreliable for detecting the presence of the drugs when they are combined with heroin in such minute quantities. And when they send the seized drugs to be tested, there’s a backlog and it can take months to find out. The bottom line, Pelletier said, is that he doesn’t believe the opioid crisis is abating, and that the drugs are extremely dangerous. “The people are buying these drugs, but they don’t know what they’re getting,” he said. Odlin-Platz said whatever the heroin is being combined with, it’s clear heroin is being mixed with other drugs, much more so than five years ago when users were more likely to obtain pure heroin. The Robinson family of South Portland is one of the seven families that cited an overdose as the cause of death in a Press Herald obituary. Joseph “JP” Robinson, 35, who lived with his parents in South Portland, died of a drug overdose while at work, said his parents, Joe and Sue Robinson. “We have so many questions, and not many answers,” Sue Robinson said. She said JP seemed to be on the right path. Though he had been battling addiction for many years, he was in methadone treatment and daily counseling. Medication-assisted treatment that combines methadone or Suboxone with therapy is considered the “gold standard” of treatment by addiction specialists. But even with proper treatment, relapse is common, research shows. JP was working full time as a car salesman, adored his two dogs and started going to church, Sue Robinson said. The family said they decided to go public to help other families dealing with substance use disorder. Sue Robinson said families often feel ashamed of the disease, but since they went public, many people have reached out to them and told them how addiction has affected their lives. Odlin-Platz said many people ask about treatment, but she has few resources she can offer people.